Starts out Good, goes downhill fast. This show started out with promise, but then went south fast. It's too full of contrived dramatic conflicts that are so forced it's impossible to swallow. For example, a fever that makes one of the girls act drunk, gets the protagonist into a compromised situation that his "girlfriend" just happens to walk in on. Then as quickly as the drunken fever came on, it goes away as soon as it's no longer needed once it yields the desired results. The main protagonist is also such a clueless jerk. He so aloof about his pretend girlfriend's feelings that he's often upsetting her by acting cold towards her because he thinks it's the right thing to do, despite the fact that it constantly upsets her. He also happens to hate his own brother, in one of those immensely exaggerated simple issue conflicts that makes them hate each other like mortal enemies, yet he will go above and beyond to risk his and his friends lives to help get another character's brother back that he knows little of. The story in general is just too full of things that happen to conveniently force the plot forward from conflict to conflict, rather then just letting it happen in a natural way. I had to drop the show as I could no longer overlook these issues to enjoy it. Hm... Where might you be going Magical Warfare? Animation: Not top notch. It was particularly bad in episode one, but when the magic got involved, although very generic in appearance (you know, glowing patters and shapes) it upped the anti, a little. Never the less, the female characters are very pretty and the glowing fairy dust that radiates from magical 'aspects' is a nice touch. But it hasn't been really utilised yet (not much fighting by episode 3 you see). There's clearly a weakness behind the art that kind of nags at you. Typical backgrounds, nothing out of the box at all (besides glowing dust/smoke - but how much can I give that really?) I enjoy looking isoshima's character, and Mui, but sometimes their more unique features aren't prominent. Male faces are flat and boring though, they all look the same from the front. What really bugs me about the animation is some of the short cuts, the biggest being, the equivalent of Japanese Hogwarts. Making everyone wear the same clothes instead of it being non-uniform was a cop out. I'm sorry, not once yet have I seen a key character out of a uniform of some kind, and under the circumstances of the plot I think it makes less sense for there to be this uniform carry on. It's definitely happening. I'm starting to understand the male protagonist better bit by bit, which I like. The two female protagonists are really developing and with minimal flash back (not a big fan of dragged on flashbacks personally, unless they're really amazing like some of the flashbacks in Asura Cryin' season 2). But inter character relations are veering dangerously close to - 'off the plot'. The heart of this show is being dragged to the background while love triangles are dominating the story line. This is wrong, they're killing a clear potential in an attempt to grab our hearts quickly. I find it very shallow. 5/10 - It's there, but will it keep moving in the wrong direction as it started in ep3? I love me a bit of fan service, and I'm getting it! It's a bit much for a show that seems to take itself seriously, but I love it!! No more, no less I say! But I would compare this show most closely to Guilty Crown. Now, undoubtably, we're already 3 episodes in and by this stage I was crying with joy at discovering such an amazing anime when I found Guilty Crown. This show is not that good, or ever will be. (Unless they totally flip the coin for (assuming) Season 2, like Asura Cryin' did! That show doubled it's awesomeness) But sorry, it's got that kind of plot feel about it, the way the protagonist deals with situations. Although Takeshi's a little more level headed off the bat. This show could bring us immense fight scenes with complicated interweaving spectacles of parallel worlds (Like Kyoumi no Kanata), love that isn't working, and a world that's just got too many self obsessed weirdos (in a good way for anime). Whether they will deliver I really can't promise you, I can say, it's worth watching up till where we are now and to follow it. But if you're swamped watching Fairy Tail, One Piece, Bleach and trying to catch up on Naruto Shippuden all at the same time, and for the first time right now, I wouldn't really encourage you to watch this. Keep your CrunchyRoll membership, and check it out at a later date to make your own opinion, but right now, this show doesn't stand out of the crowd enough, even though I feel it's still got the potential to explode like Guilty Crown did (but no where near as beautifully because the animators seem a little lazy) right now it could easily slip your mind, be another anime series with 3 watched episodes you'll never finish because for some reason you never feel like it's the right time to watch it. Especially here because it's surrounded by distinctly better anime you're paying the same price for! ***Whenever I review a show so early in it's release I like to boost my initial '/10' rating by 1, so to include it's potential. Sometimes 2 if I really feel it's going to deliver. I'm not sure this is going to deliver. I hope I wasn't too one sided! I wanted to talk about it's good points as well as bad, because everyone's reviews seem a little mean at the moment. Truth is, this show is average. I think people are hating because it doesn't have to be average! The protagonist is kool, the characters are kool. Magic is kool. But everything else is lame right now. As I say, give it a go if like me, you've gotten to a point where you're more interested in Simulcasts than the finished classics, because you've already watched them! But don't if you're swamped with great stuff, because it'll really put this show down... You won't see what it could be. So basically, after a train wreck of like... 10 episodes of NOTHING important happening. You finally find out like... A small window of the past of whatever the heck has happened in this world, and only enough to wet your whistle to keep you interested to watch the last 2 more episodes of terrible-ness. Only to be left in a pile of crap and a sudden realization that you'd just wasted 4 hours of your life, only to come to a conclusion that this anime sucked. For watching the anime, i SUPPOSE you could say there was some symbolization or some CRAP about some of the anime, or as the theorists say there was evidence to TRY and piece together a possible outcome... But really those that just watched the anime and didn't bother to read the LN are left in a world of WTF just happened? I don't even know, i had to go to the LN's to learn something actually happened, and multiple discussion boards to theorycraft a real ending. Don't watch this if you are looking for anything relevant to a good ending. This has to be one the worst anime ever on Crunchyroll. I've seen some bad plots, but this one just takes the crown. Not only is the story full of plot holes, but the ending skipped so much of story its not even worth figuring out what the writers were smoking when they wrote that crap. There are anime that leaves plot at the end even better than this. Magical warfare is poorly written PERIOD!! Animation: Ok, standard for the time but nothing special. Music: mediocre, standard for the time, but nothing special. Characters: Flat and predictable. It's like the writers went bargain shopping at cliche world. The started out as pretty standard, but mostly an enjoyable time killer. Then the second half of the show tried to cram in 100 different new things. It didn't work. They tried to cram 20 lbs of crap into a 5lb bag and they made a mess of things. 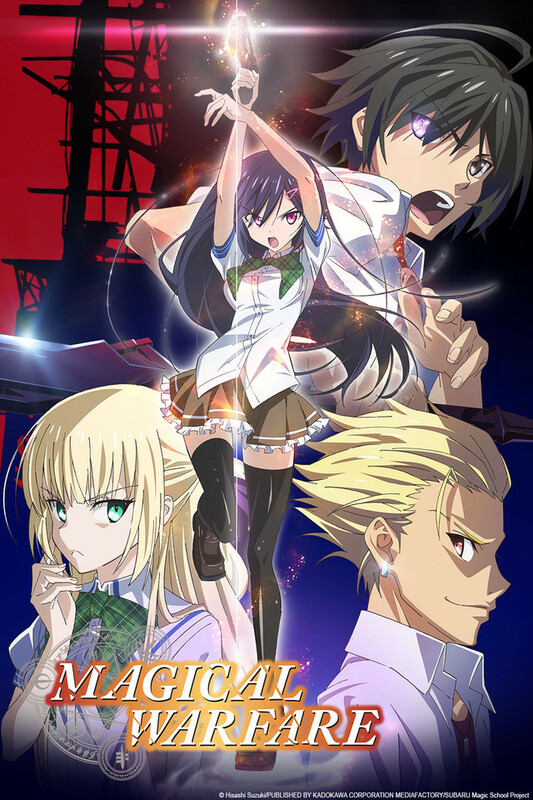 I just finished this anime, and please, please, please, save yourself from the train wreck of a plot that is Magical Warfare. If you go into this anime blind, without having read anything regarding it, you'll come out at the end knowing just as much. This was four and a half hours I can never get back. Just as I though when the first episode aired, this show isn't going to go anywhere. The fact that most people realized this after a few weeks kinda makes me sad, and there's the other fact that some people thought this was actually good. In the beginning there were already clues given out to why this show was going to fail. One its your typical boy meets girl type of beginning, second the fact that you can give anyone magic is kinda adsorbed. Three the story was not appealing in anyway, overall there was no character devolvement and the whole thing was just rushed. Although I do believe this wasn't the real ending, there should no point in making more since who ever directed already messed up to bad to keep continuing. The first few episodes I was hooked at I couldn't wait to find out what happened and I was really excited to find out what would happen but then as the episodes slowly passed by it just sloping downwards into a story that sadly to me (and potentially lots of others by reading the comments posted by others on the last episode) made no sense, and was hard to follow. Show had a lot of promise at the start but never brought it together. The fact that both brothers cannot forget the past and move forward rings true but only to a point. Once you beat the crap out of someone, commit kidnapping and theft just out of spite, even a stubborn idiot will realize that pearson is not a good or decent individual. Unfortunately this is an all too common plot device for the MC to lower his guard and get hurt/beat/fail/killed temporarily for dramatic emphasis. Also like so many anime shows this would appear to need a full 24 episodes to fully develop the arc but that will not be happening. So instead the producers throw a whole bunch of questions in the ending at the viewer so maybe they will by the books or manga to continue the story. I fully acknowledge that anime is primarily a advertisement for the original source material but the days of my accepting shows that start a story arc and fail to finish it are long since past. If you start an arc then finish it, I would rather deal with a little bit of poetic license in order to squeeze an arc inside 12 episodes rather than know I will never know what the hech is going on. I really liked how this anime started, and it was a lot of fun. But at the end, I just felt like I had wasted my time watching it. It felt unresolved, and left you wanting more. But not wanting more in a good way, more as in the "I'm so confused, I need more to just know what is going on". If you're just looking for something to fill our time, then it's there. Just don't expect it to keep up.